This weekend, I did some cooking. I cooked 3 things. First thing was a chuck roast in the crockpot so I can mix up my lunch sandwiches (I've been eating strictly almond butter and jelly on sprouted grain bread). Now, I can also have slow cooker chuck roast with light mayo on sprouted grain bread with a small amount of sea salt for taste. 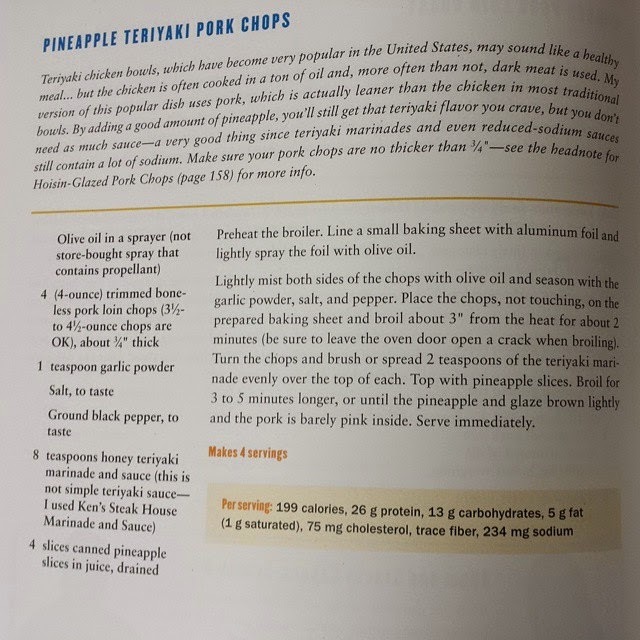 The next thing I made was some pineapple teriyaki pork chops. They are sooooo good! I got the recipe from my The Biggest Loser Family Cookbook. The third thing I made was a salmon casserole (I posted this recipe yesterday). Also very delicious. I've already got 2 recipes picked out to make next weekend...and I'm pretty excited about them! Saturday I ran a 14 mile training run. That is a tie for my longest run ever. Last time I ran this distance was September 9th 2013. When I started running, it was raining and my pace was great! I was in the mid 11 minute range. YAY! I held up this pace through mile 10. By this point, it had stopped raining, so I had slowly started inching closer to the 12 minute mark. In mile 11 is when the blister started and when I started slowing down. By the end, I had hit the 13 minute mark. Ugh. This run started off so fantastic and ended so blah. I'm not going to say "bad" because in my mind, no run is actually a bad run. In reality, I should have actually monitored my pace at the beginning and kept myself at no faster than 12 minute miles. I was just running by feel and I didn't FEEL fast (for me the mid-11's, while becoming my norm, are still considered "fast" by me for me). My legs were so stiff and sore by the end of Saturday that I decided I would move Sunday's 3.3 miles to Monday. When I woke up Sunday, I was so stiff everywhere. I immediately decided to just cancel my 3.3 mile run and take 2 rest days. I did go to the gym yesterday and do a little over 30 minutes of circuit training. Today, I was going to go ride the stationary bike at the gym, but decided to just completely rest my legs today. My legs feel good today and I'm itching/aching to run, so I know I'll be ready for tomorrow's 7 miles. And now for some Friend Making Monday action...and I'm pretty excited about this one! I wrote these questions. I tried my best to make the questions as neutral as I could, but if you know me, you know I had running in mind when I wrote them. I also did not go ahead and pre-write my answers to these questions. I answered them this morning. So, here we go! running, of course! haha! i love running because it's like meditation for me. i can just head out the door and bam, i'm in "the zone." it relaxes me and reduces tension...it helps me sort out issues and come up with solutions to problems. and it makes me feel accomplished...like i can do anything i put my mind to. 2. How did you get started with your favorite form of exercise? originally, back when i was 18, i was in the Army and i ran all the time. granted, the distances i ran were probably no more than 5 miles, but we still ran all the time. back then, i ran about a 9 min mile. then, i got really back stress fractures in my shins and stopped running. i actually had a doctor's note that said i wasn't allowed to run. anyway, fast forward to like 14 years later, i'm in my early mid-30's and i'm severely overweight. i know that running is an excellent way to get healthy and lose weight. and i've wanted to run again for a while at this point. so, i go and get fitted for some running shoes and, at about 240 lbs, i start doing intervals on the treadmill a few times a week. after a few weeks, the pain in my shins is so great that i believe i've refractured the stress fractures i had gotten there back in the Army (little did i know that once a stress fracture heals, the bone is actually stronger there than it was before the fracture). so i went to the doctor. he said it wasn't stress fractures but shin splints and to stay off the treadmill. i'm not sure if he meant to stop running on the treadmill and go run outside or stop running altogether. i took it to mean the second one and felt defeated. i relegated my new expensive running shoes to be my walking shoes and i would go for 3-8 mile walks 3 times a week. anyway, fast forward another year and a half and i hear about a company called Airrosti that specializes in soft tissue damage repair (this is what shin splints are). i make an appointment and the doctor says my shin splints are some of the worst he's ever seen and immediately sets about smoothing the fascia on my shins. holy heck was that painful. he also had me bring in my running shoes and told me that the soles were completely broken down and i needed a new pair. as part of my therapy and rehab for "fixing" my shin splints, he told me to run regularly. usually, they "fix" you within 3 visits. my shin splints were so bad, i needed a 4th visit. anyway, the shin splints went away and only every now and then do i get shin aches...but even then, they only last for a mile or two and then they go away. after getting my shin splints "fixed" i set about a couch to 5k program i just made up as i went. i did all my intervals on the treadmill. once i had run 3 miles without stopping on the treadmill, i switched to running outside and have only run on the treadmill when it was unsafe to run outside (read: icy). 3. What is your favorite thing about your favorite exercise? it's an amazing release for me. it clears my mind and it makes me feel strong and capable. 4. Does your favorite exercise offer any type of competition? If so have you taken part in one? yes, there are a plethora of races ranging from fun run 1k's up to 100 mile ultra marathons. i've ran numerous 5k's, 10k's, 8k's, a 15k, and 4 half marathons. i've also participated in a few virtual races (you pay your registration fee...way cheaper than an organized race because there are no aid stations to man, no barriers to rent, no police officers to hire to guard the intersections for your safety, etc...and then you go out, run your chosen distance and then plug your time into their website and they send you your medal). i have a current collection of 10 medals. i'll be earning 3 more medals this year (1 virtual half marathon, 1 organized half marathon, and my first full marathon). 5. How old were you when you started your favorite form of exercise or how long have you been doing it for? i was 35. my "runniversary" is the 19th of this month...i will have been running for 2 years. yay! i don't really have anything spectacular planned, just a 5 mile training run. 6. Is there a form of exercise that you have never tried that you really want to? What and Why? 7. Do you plan vacations around your favorite exercise? sort of. i had planned a trip to visit my family in Oregon earlier this year. i knew when i wanted to go (the first 2 weeks of June), so i set about finding a race that would get me some bling while i was there. while i didn't plan the trip around the race, per se, as in it was the main point and everything else secondary. but, i did plan how i spent my time during my 2 weeks in Oregon according to this half marathon. in december, i have planned a weekend trip with my awesome friend Amanda to celebrate my birthday and for me to run my very first full marathon! 8. Does your favorite exercise have it's own elites? Who are your favorites? yes, there are a lot of elite runners. lots of people to admire and look up to. and i read Runner's World magazine all the time and they interview these elites frequently and they are awesome people and they are normal, relatable people. they have struggles just like we do, they just happen to be waaaaaay faster than i could ever hope to be. the day i can do a 9 min mile and that be my normal average pace will be the day that i'm the happiest girl in the world. anyway, i LOVE Shalane Flannagan. she is simply amazing...and it helps that she trains in my homestate of Oregon, so it's like rooting for the home team, you know? 9. How does participating in your favorite exercise make you feel? just plain amazing. 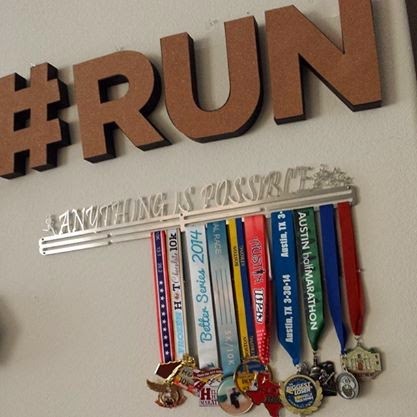 like my medal holder says, "anything is possible"...you just have to believe in yourself. every time i finish a run that felt "bad" or "rough", i am proud of myself for not quitting. no one is making me do this. i'm not part of a team. it's not life or death that i run. this is something i CHOSE for myself. i know by choosing to run that i am choosing a happier and healthier life for myself. i feel strong thanks to my running in more than just a physical way. running has helped me gain so much self confidence. YES! i don't care if i'm 80 when i finally get my BQ, i will get it one day! i definitely will not quit running until i am no longer physically able to.